After making your investment in an authentic Oriental rug you want tomaintain it. Who should you trust in Rancho Cordova and the Sacramento area for cleaning your Oriental and custom rugs? Oriental rugs deserve careful maintenance, and our time-tested procedures provide the quality care that you are searching for. Artistic Associates uses an eight-step process when cleaning every custom-made rug. Our cumulative experience allows us to successfully repairing all types of damage from moths and beetles, water seepage, food stains and even pet urine. Artistic Associates also provides fiber protectants and custom-fit underlayments to preserve your heirloom rug. 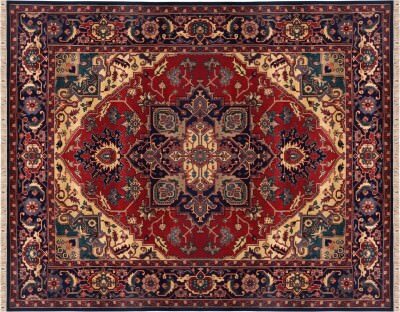 Oriental rugs present many complications for ordinary carpet cleaners. Natural dyes can bleed when moistened. Hot water cleaning treatments, that are the best technique for cleaning synthetic fibers, can destroy natural fibers. Unless you want to replace your floor piece, you need a trained professional. Artistic Associates applies more than forty years of experience to cleaning Oriental rugs. Plus, we proudly display our full certification from the Institute for Inspection, Cleaning and Restoration as qualified experts. This expertise is essential if you want a rug that continues to look like new. Your wool, silk and traditional Oriental rugs are treated in our own specialized facilities – not by an unknown subcontractor. Working in our family shop allows Artistic Associates to thoroughly and safely inspect every rug’s fabric and dyes before proceeding to a complete cleaning. This insures that your rug is cared for by hand, not by machines, and comes back to you in better condition than we received it. Artistic Associates is fully insured and bonded. However, it’s our time-tested procedures, certified technicians and in-house facilities that are the primary guarantee that your Oriental and custom rugs will look pristine. Choose the Oriental rug cleaning service that Rancho Cordova can trust! Review our training, facilities and honest pricing to realize that the maintenance and repair of your Oriental rugs will be a pleasant process. You may contact us at 916.483.7400.